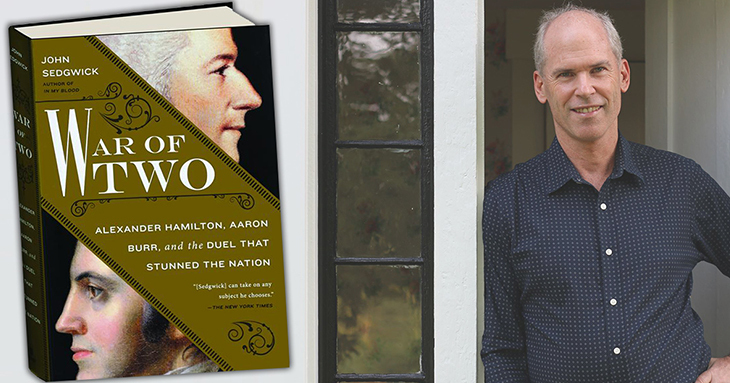 The Society of the Cincinnati in the State of New Jersey has named John Sedgwick the recipient of its 2018 New Jersey History Prize for his book, War of Two: Alexander Hamilton, Aaron Burr, and the Duel that Stunned the Nation. The Society of the Cincinnati, the oldest hereditary organization in the United States, is comprised of descendants of the officers of the Continental Army, and is organized into thirteen constituent societies representing the original colonies, as well as a French society. Since 1980, the Society of the Cincinnati in the State of New Jersey has made an annual award to a person chosen for “distinguished achievement in advancing the knowledge, understanding, and appreciation of American History.” Preference is given to work on the history of the United States in its Colonial, Revolutionary and Federal periods; and to work done by persons associated with New Jersey institutions or agencies. “We are pleased that John Sedgwick joins a long list of distinguished winners of our History Prize,” says Maghan. Mr. Sedgwick will be presented with the award at the Society of the Cincinnati in the State of New Jersey’s annual fall meeting and banquet at the Society of the Cincinnati Headquarters in Washington, D.C. on Saturday, October 6th.